It never hurts to check. 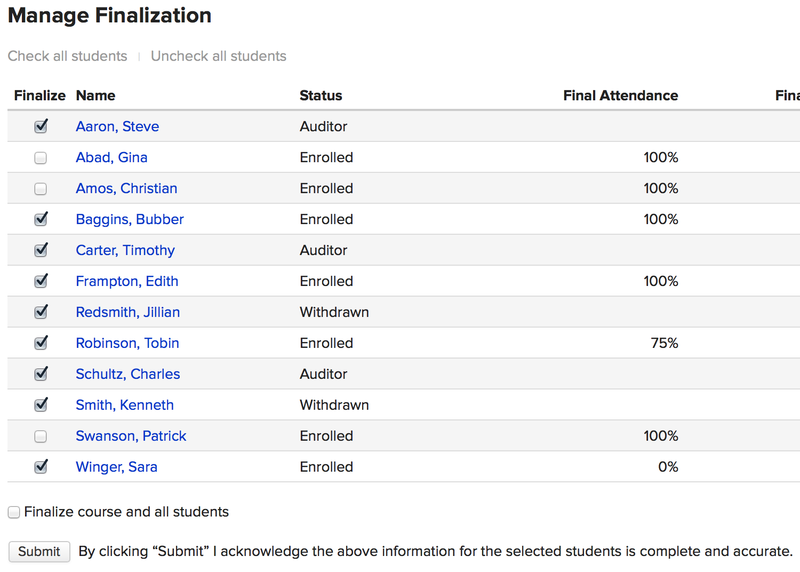 To see if the student is finalized, go to the Course Roster and look in the Status column. If the student has a lock next to his status, then he is finalized. In the example above, Gina has no finalization lock, and is therefore still able to actively participate in course activities. Christian, on the other hand, does have the lock, and so you cannot make any changes to him (save for incomplete grade-entry and retake settings). On the Course Info tab, you'll have two options for getting to the finalization screen. Un-check the boxes next to the students you wish to unfinalize. You can also Uncheck all students. Note that when you do this, it also un-checks Finalize course and all students. Students who remain checked will remain finalized. When you're ready, click Submit at the bottom of the page. You can update any of their course information—enrollment status, assignment grades, attendance, and so on. 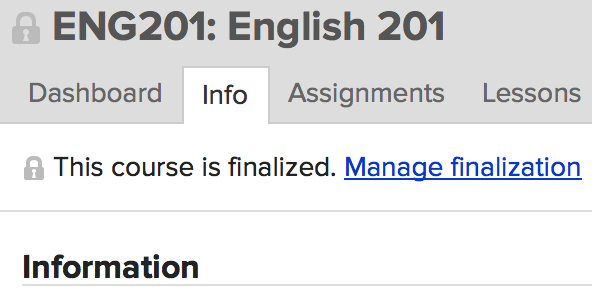 Course faculty can also make changes to the student's interaction with the course (add grades, update attendance, etc. )—as well as the course itself (course content, lessons, assignments, etc.). If the student has an active Populi user account, he can also interact with the course as normal—take tests, upload assignments, participate in discussions, etc. 5. Make sure to re-finalize! When you're done, either you or the course faculty can finalize the course and student(s).